Grimshaw has been awarded International Practice of the Year at the Architects’ Journal AJ100 Awards, for the second time in three years. Grimshaw was also nominated for Employer of the Year, Practice of the Year, and Best Use of Technology. The award, which celebrates the 100 largest architectural practices in the United Kingdom, is a recognition of a practice’s global reach, growth, and business practices. The AJ called Grimshaw the ‘stand-out winner of this category’. A long period of growth for the architecture practice has in the past year been marked by expansion into new offices in Dubai, Los Angeles, a project office in Paris, and several high-profile project wins and completions around the world. The AJ drew particular attention to the practice’s success in cross-office working, with project teams made up of staff of over 46 different nationalities collaborating on projects and sharing knowledge internationally. The judges said of the practice: “With its impressive network of autonomous studios across the globe, the judges praised the excellent knowledge transfer and collaboration within this stand-out practice.” The judges went on to say that, in all, Grimshaw is a practice that ‘resonates’ internationally and ‘recognises its strength as a satellite organisation, leading from different places’. Significantly, through 2017 and 2018 the practice has completed the Phillip and Patricia Frost Museum of Science in the USA, a collection of commercial projects in Melbourne and Sydney, Australia, while the redeveloped London Bridge Station opened to the public. Grimshaw has recently completed an exciting collaboration with Walt Disney Imagineering at the Shanghai Disney Resort’s Tomorrowland. Working hand in hand with the Imagineers, the Grimshaw team has designed a unique experience for guests to the company’s newest theme park. This week marked the official launch of Grimshaw’s Dubai office, located in the D3 Design District. After many years of working on projects in the Middle East, the Dubai office will act as a central hub for the projects in the region, a number of which are now on site. A key part of Grimshaw’s design ethos is to gain a deep understanding of project locations in order to become immersed in the local culture and environment. While providing the opportunity for face-to-face client support, the Dubai office is also set up to collaborate with other Grimshaw offices across the global network to encourage knowledge exchange within the company. 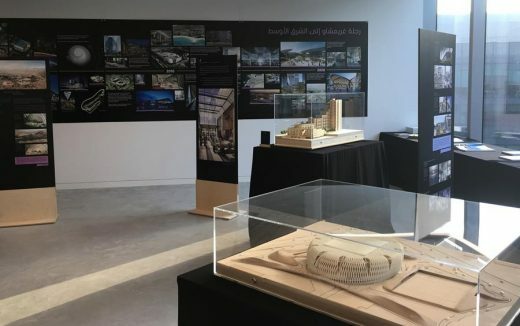 The architectural practice continues to work on projects initiated from its Doha office, but now with an added office resource in the UAE to support a major project in its design and construction; the Dubai Expo 2020 Sustainability Pavilion. Set to open in October 2020, the pavilion is a celebration of ecology and will be a working demonstration of sustainable design. 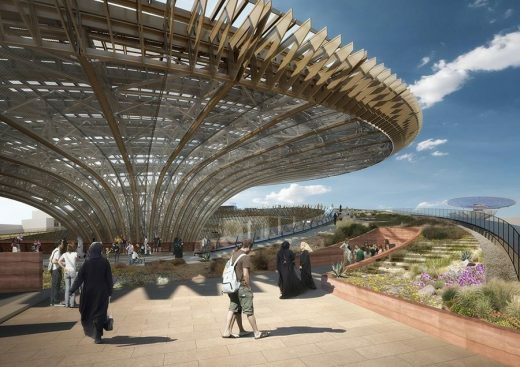 The core exhibition building is crowned by an over-arching roof structure with sizable photovoltaic panels designed to draw energy from the sun to power the site, and a series of ‘solar trees’ are designed to harvest water from the humid atmosphere. Importantly, as a legacy project for the Dubai Expo, the Sustainability Pavilion will remain on site as a permanent fixture. Other key projects in the region include a high-end retail and entertainment destination; a grand-scale botanic garden in Oman; and a number of transit, sports and leisure projects in Qatar. The Dubai office is currently displaying an exhibition titled ‘Emergence’, which explores three themes within Grimshaw’s work in the Middle East: ecology, legacy and future urbanism. Additional initiatives include an Open House and VR Workshop at Dubai Design Week on November 14th – 15th, 2017. Grimshaw has added a dynamic and original airport seating system to its portfolio. The system joins a number of the world’s most pivotal aviation schemes, with projects at all scales including the upcoming landmark Heathrow expansion and a new concourse for Heathrow’s existing Terminal Two. The Aeris seating system, designed for Tecno, launched at Passenger Terminal Expo in Amsterdam last month. The system is borne from a longstanding partnership between Grimshaw and Tecno, who have spent the previous 12 months working through a rigorous design and prototyping process. Aeris is a response to the needs of the rapidly changing airport environment. With a highly durable and striking die-cast aluminium leg structure, its elegant appearance belies a highly flexible modular system capable of accommodating various accessibility needs. Above all, it is crafted as the pinnacle in comfort. The Aeris system is available now via Tecno. Grimshaw are engaged to provide architectural and urban design expertise in the development of Heathrow Airport’s plans for expansion. The expansion will deliver a world-class sustainable airport, championing the very best of British design, making Heathrow the largest transport hub in the whole of Europe. A blend of culture and hospitality will meet cutting-edge passenger processing, with new technology and energy-reducing measures realising Heathrow’s aspirations for the world’s leading sustainable airport. Estimates show the development providing a potential £211 bn in growth and up to 180,000 jobs for the UK. It will also connect up to 120 direct long haul destinations, making the UK the most connected country in the world. “We are excited to unveil a collection of short films that capture the myriad of stories behind our projects. Produced by Oxford Film & Television, the stories span the practice’s history from the late 60s to the present day. Experience the schemes that define our practice and how we work, with unique insights from key architects, clients and the people who use our buildings on a daily basis. 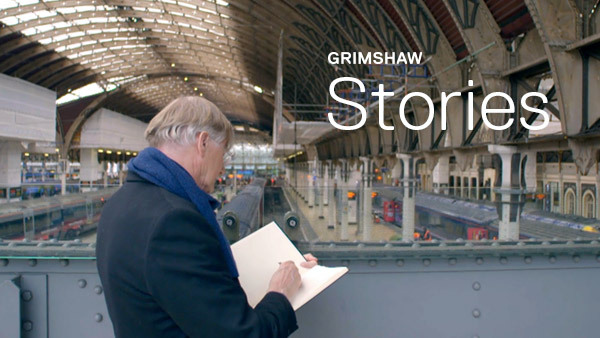 The films will be released in pairs fortnightly on the Stories page of the new website: grimshaw.global. Available to view now are the Fulton Center and igus Headquarters films; sign up at the bottom of the page to receive notification of each film release. The brand new site incorporates these stories to present an overview of Grimshaw today, operating around the globe, working on a great variety of projects. Project pages are enriched with detail from concept to completion, there is in-depth information about our practice’s culture, and the chance to contact any of our global offices for new work or recruitment opportunities. 1 Apr 2014 – ‘Elements’ industrial design exhibition debuts in Milan, Italy. Grimshaw, in association with Poltrona Frau, presents Elements Exhibition at the FuoriSalone in Milan, Italy from 8th April until 13th April. Elements showcases the work of Grimshaw Industrial Design, including the latest bespoke projects from the practice, as well as a range of industrial design components embedded in some of the company’s more prominent architectural projects. Presented inside prefabricated steel cases, the exhibition will feature mixed-media content including photography, drawings, models and structural details. Several key projects in the exhibition will be brought to life using the latest 3D-augmented reality technology, which can be viewed on a smartphone or tablet through a specially developed Elements app. 4 Mar 2013 – Working in the Future City is the second Urban Research Unit event of 2013 and the first to be held in London. The debate will examine current working patterns within London and New York and will discuss how they have shaped both cities. David Twohig Development Director at Battersea Power Station Development Co.
Urban Research Unit (URU) is founded by Grimshaw and FutureCity in collaboration with the Fellows of the RSA. URU is a one-year research project focused on urban design, masterplanning and placemaking. It will include a series of eight panel discussions, four in London and four in New York, that will use various urban factors to compare and contrast New York and London. 8 Oct 2012 – In response to project opportunities in various regions of the world, Grimshaw is growing its practice through the establishment of an office in Doha, Qatar, the invitation of four new partners to the partnership, and the establishment of a Managing Partner for International Operations. 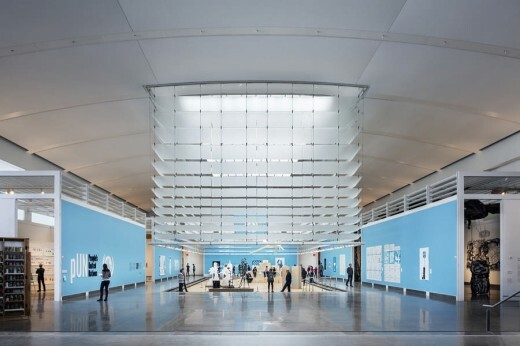 All of these moves are rooted in the optimism and conviction of the practice as it builds upon its reputation for inventive, innovative architecture across all building sectors and across the globe. Recognizing the potential of the region, Grimshaw has committed to a permanent presence in Doha, the capital of the rapidly ascending nation of Qatar. The practice is currently working with the New Doha International Airport to deliver a suite of buildings on their expanding campus including the headquarters for the Qatar Civil Aviation Authority. The new Doha office, in addition to supporting current projects, will also play a strategic role in the procurement of further work in the Middle East region, bringing the thoughtful, personal service that Grimshaw is known for to this part of the world. Growth in our existing international offices necessitated additional space, and we are pleased to have moved to new premises in New York, Melbourne, and Sydney. All three offices have undertaken renovation projects to adapt existing industrial warehouse buildings to the needs of the practice in an effort to promote the efficiency and sustainability of resources in the cities in which we work. To supplement our international growth, the current partnership has expand to 18 individuals with the invitation of Declan McCafferty, Neill McClements and Andrew Thomas in London, and Juan Porral, who oversees our work in Doha. All four have developed within the practice over many years, providing their expertise and leadership to some of Grimshaw’s most prominent projects. Additionally, current Grimshaw partner Mark Middleton has been appointed Managing Partner of the London office. Mark has been instrumental in many of our major infrastructure projects and recent project wins including redevelopment work at London Bridge and Euston Stations and substantial aviation work in the United Kingdom and internationally. Keith Brewis, previously Managing Partner for Grimshaw’s Melbourne and Sydney offices, has been appointed Managing Partner of International Operations. In this new position Keith will focus on project opportunities beyond our existing locations, with the engagement of all five Grimshaw offices. Grimshaw is proud to announce these steps forward as the practice looks to a bright, vibrant future producing functional, uplifting design rooted in its place. In addition to commissions at the New Doha International Airport, Grimshaw’s Doha office is also working with prestigious national agencies including the Qatar Olympic Committee. The practice is currently engaged with Shafallah, a part of the Qatar Foundation, developing preliminary designs for a new genetics research centre aimed at addressing disabilities in children. The Grimshaw-designed Qatar National Pavilion was also recently erected at the United Nations Conference on Sustainable Development in Brazil. The temporary structure was commissioned by the Qatar National Food Security Programme. Grimshaw will be hosting a reception tonight to celebrate 30 years of practice at the St Botolph Building in the City of London. June 29, 2018 in Architects.